A brand-new case Design that offers a pretty neat trick: the ability to fold, origami-style into a stand that can be used in portrait or landscape mode. The integrated Origami cover stands your device in either landscape or portrait orientation so you can enjoy your content hands-free. 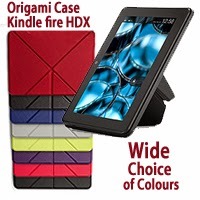 The magnetised Origami panels keep your Kindle Fire HDX 7" securely upright for steady viewing. Crafted from top quality leather and matching microfibre interior, the case protects your tablet and keeps your screen clean and comes in a variety of colours. Ideal for browsing the web at home or working! “The Child Of The Cavern” is set beneath the earth in an underground coal mine in Scotland. 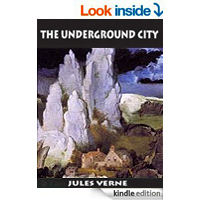 A newly discovered vein of coal revitalizes this nearly abandoned subterranean village, but strange events start occurring that the populace cannot explain. Is there someone else living in these dark and narrow mines? The first part is actually amazing on the geology, industry, etc. It is relatively strange knowing that plate tectonics was to be revealed only 100yrs after this book was written.